LOS ANGELES, CA: Julian Construction (julianconstruction.com), a foundation repair and construction company in Southern California, recently offered tips to the public on how to strengthen their home foundations. Partner Sean Kyles says that if certain precautions are taken, the home will be much more likely to withstand the next big earthquake. Kyles then goes on to list house bolting, also called earthquake retrofitting, as an important action that many homes, especially older ones, will need. 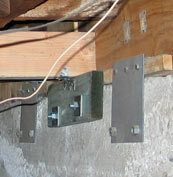 Other actions listed include underpinning, and bracing of cripple walls. The full article can be seen here.